Infrastructure development in India is seeing high demand, prompting companies to adopt new technologies and machines to ensure good quality work and timely completion. The government too has worked out several workable models like EPC contracts and Hybrid Annuity projects, which have been quite successful in meeting the projected infra development. At the same time, the model concession agreements are being continuously reviewed to mitigate risk to the banks and investors, and to ensure contractors’ profitability. In view of the central government’s development agenda, advanced construction technologies, machines and methodologies are being examined and subsequent trails are being made on their performance as per Indian specifications and conditions. Companies from across the world are also viewing the projects and development plans being announced by the government. They are keeping track of the projects being awarded, and noting their progress every year. These companies are promoting their technologies and expertise to offer speed of construction, mitigate material deficit by reuse of reclaimed materials from site, and bring cost effective solutions, without compromising on the quality of construction. In the highly competitive environment, cost benefit analysis is being continuously worked out, since execution of a project within the prescribed budget remains a big challenge. Every contractor is working out different options for execution of projects within the timeframe and keeping in mind the requisite quality parameters, to avoid any cost overruns. Most Indian companies follow the mantra of on-time or early completion of projects, and claim bonus as per the contractual provisions, and also save on overhead charges. All of this has helped them book profits. Soil stabilization: This gives the required strength by which a layer of road making can be saved, and in turn, saving the environment. Warm mix technology: This allows bitumen mix to be paved on roads at a lower temperature, with good workability and better stability of the roads, which helps save on fuel and lower emission of toxic gas into the environment. Cold mix technology: This has been quite prevalent in the construction of rural roads in India. As most of the highways in India are widened and rehabilitated, there are many sections that require profile corrections, junctions need modifications and reconstruction, and approach roads where reclaimed material is used - the most valuable being asphalt pavement - which has a good percentage of bitumen content and aggregates. All these materials are milled using milling machines for optimum recovery of materials and piled up at locations close to the Hot Mix plants. The RAP is processed along with virgin aggregates and bitumen in RAP ready Hot Mix plant for bituminous coarse material. G R Infraprojects Ltd. bought the first TEREX Warrior 600 screen, a long-awaited equipment required for production of optimum mix quality using RAP ready Hot Mix plant. GR Infra could feed coarser material in the RAP ring of plant and finer RAP with high bitumen content into the plant mixer directly, to produce a better mix that retains the bitumen properties present in RAP. This has commercial advantage as it enables better quality of roads, and saves the environment from mining of aggregates etc. Due to the several advantages provided by the equipment, G R Infraprojects today has three Warrior 600 Screens, and it plans to have one with every RAP ready Hot Mix Plant. The company also owns TEREX track-mounted crushers to meet the demand for aggregates for making flexible and rigid pavements across the country. 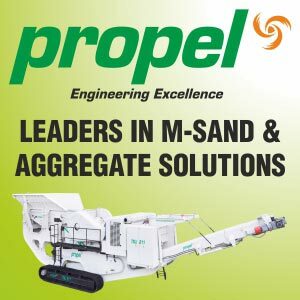 Due to the strict environmental norms in India, the mobility advantage of the track-mounted crushers has helped the company to shift crushers frequently at strategic locations for optimum production of quality aggregates and the GSB, which is required in volumes. Continuous support by the TEREX service and support team has kept the machines running to enable speed of construction and, in turn, helped GR Infra to maintain the company’s USP of completing projects on or before time.